Buddy’s Orange mixed with ice cream makes a terrific “Dreamsicle”. Buddy’s Grape mixed with ice cream makes a great “Purple Cow”. 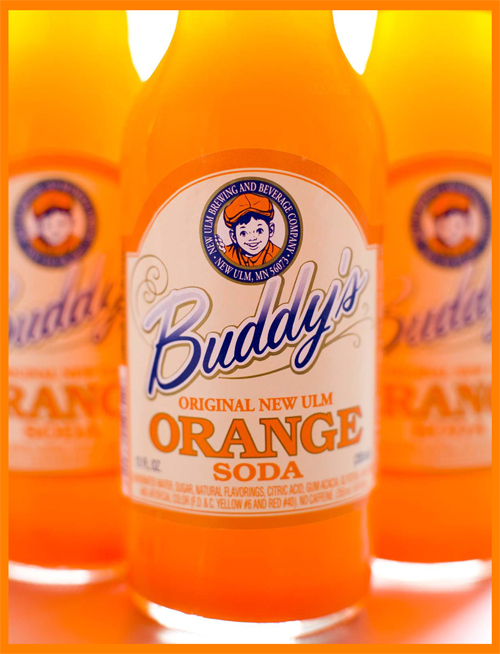 A talented bartender is only limited by his imagination… Buddy’s Original New Ulm Sodas offer excellent fruit flavored quality beverages for creating flavorful new cocktails. A Buddy Push-up is a shot of vanilla schnapps on ice with Buddy’s Orange and topped with cream. The original Grape Ape is made with Buddy’s Original New Ulm Grape Soda. Buddy’s Grape gives the Grape Ape the cool refreshing finish. Buddy’s Strawberry with Lemonade Schnapps over ice and served with a lemon slice and a strawberry creates a great adult cocktail. All Buddy’s flavors may be whipped with ice cream for a wonderful cool treat. Adult beverages may include a complimentary liquor whipped into the mix and all may be enhanced in appearance by coordinating fruit decorations.